Lately I’ve been feeling a bit nostalgic. That may seem pretty silly considering I am only 23, but I get caught up in old memories and (luckily for you) wrapped up inside the food that went alongside them. The first of which is this ridiculously named pizza. I did not name it though, dear reader. Like every other food I hold dear to my heart, this magical pizza — The Man Pizza — has a story. My junior year of college, I was in a 4 hour long Holocaust musical called Ghetto. It was a bizarre and unique experience considering I traumatically got to shave someone’s head live on stage one night. I am thankful for the show though because it introduced me to my best friend Andrew. Andrew loves food just as much as I do and we would cook all sorts of stuff up in his tiny apartment kitchen. However, when it came time to watch movies we would call up Dominos and order this pizza. The first time Andrew made the order, I laughed as he told the person on the other end what we wanted. A pizza with no marinara? What kind of Italian did he think I was? Yes, this pizzas sauce-filled layer isn’t red, it’s BBQ sauce. Sweet, tangy barbecue sauce accompanies chicken, mushrooms, and bacon. I still to this day have little idea why Andrew refers to it as Man Pizza. All I know is that it is disgustingly awesome and I am so glad I was adventurous enough to grab a slice the first night the delivery boy brought it to our door. 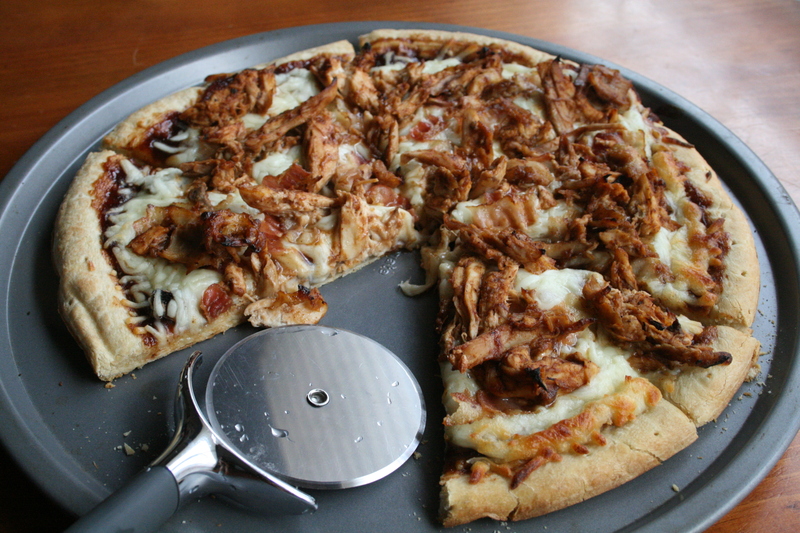 To re-create this pizza, I decided to use rotisserie chicken because I thought it would amp up the flavor. I also bought store bought pizza crust because I have not mastered yeast yet. I know, what kind of food blogger am I that I am scared of a little yeast? I found this delicious crust called Mama Mary’s. The crusts come two to a package and I probably will eat the other one by itself because it’s pretty delicious on its own. No guilt. 2. Take the skin off your rotisserie chicken. Using two forks, shred the chicken, being careful to remove any bones. Place in a large bowl. 3. Pour 1/4 cup of the BBQ onto the shredded chicken and mix until chicken in completely coated. 4. Place the pizza crust you will be using onto a 9 in. pizza pan. Spread remaining sauce evenly onto the crust. 5. Top the sauce with sliced mushrooms. Cover evenly with cheese. 6. Top your cheese with chicken and bacon. Disclaimer: Mama Mary’s did not compensate me for mentioning them in this post. I just really liked the product and wanted to share it with you. This entry was posted in Main Dishes and tagged bacon, chicken, mushrooms, nostalgia, pizza. Bookmark the permalink.